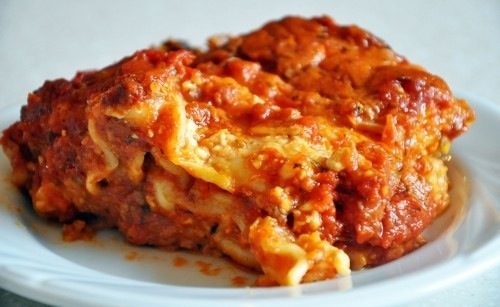 I love lasagna. My mum always made a good one and when I lived with my brother for a while we tried to make the perfect one. I’ve tried pre-cooking the pasta, always make the white sauce without milk so finding a good alternative was a struggle (mistaking sweetened soy was a fatal error!). However I have just with my hubby made my fifth PERFECT lasagna. Here’s how we do it- in the slow cooker. I love the slow cooker, I got it when I had my first baby as making dinner was a constant struggle, she would always need constant feeding and holding from about 4pm. So making dinner during her morning nap was a constant godsend for me. Now it’s just great to enjoy the afternoon with the constant pressure of dinner over my head. The food has always been perfect. It was only recently I stumbled upon the idea of doing it in the slow cooker. Pinterest I love you. Put onion, celery, carrot, ginger and garlic with fresh herbs (except bay leaf)into food processor. Blitz till all chopped. Heat some olive/coconut oil in a deep stockpot. Fry off and add meat. When browned add tinned tomatoes, stock, purée, and optional extras ie wine. Add bay leaf. It’s okay if it’s quite wet. You want that to cook down and reduce on low for at least an hour. Whilst this is cooking, melt butter in another saucepan. When melted add flour until you have a roux. Slowly add fluid (water/milk) stop and start continually mixing on a very low heat. Add cheese/mustard. Set aside. Turn crockpot onto low- add half mince- layer pasta- then white sauce- then pasta- then meat sauce- then white sauce with some extra cheese on top. Cook for 6 hours (I put mine on at 11am turn it to warm at 5pm and serve at 6.30. Serve with a colourful salad.